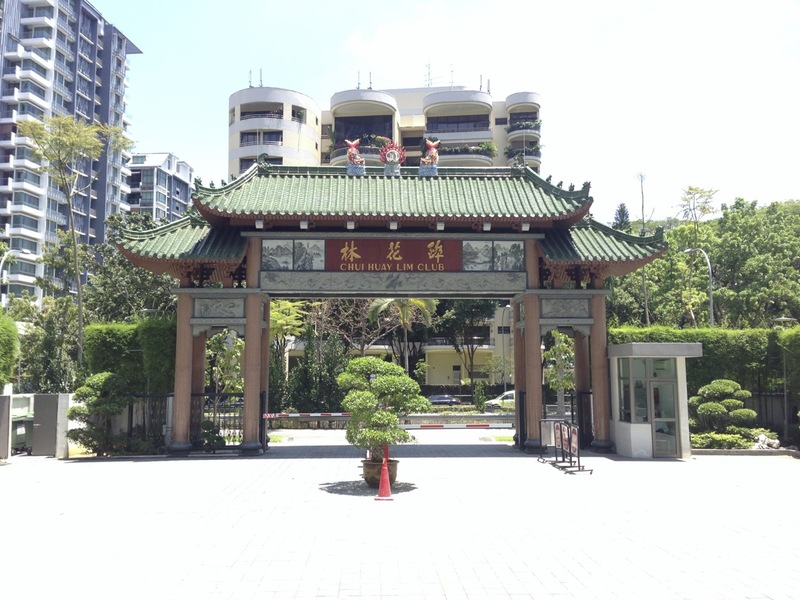 ChuiHuayLim 醉花林 was a private Teochew club that made up businessman with two things in common – firstly, their ancestry is from Teochew (Chiuchow if you are from Hong Kong), which is an area in Guangdong province of China, and secondly, they are all very rich. 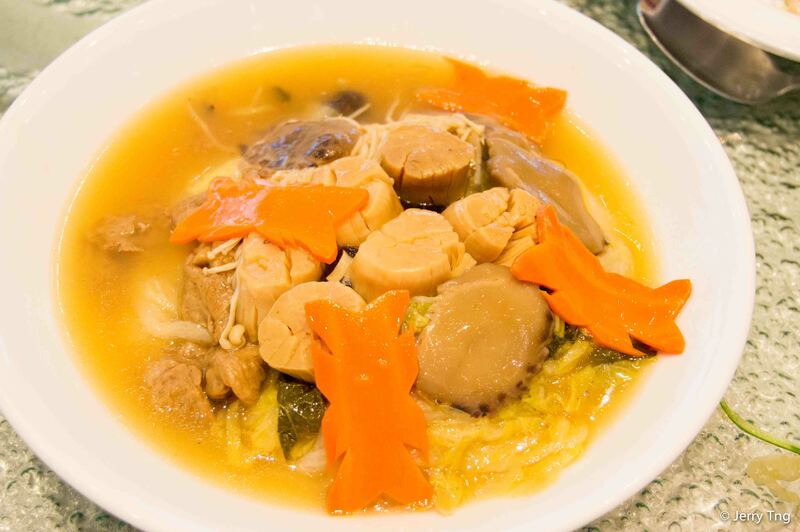 Until recently, this über-exclusive gathering place was not open to public, and only the small group enjoyed a very fine Teochew restaurant that was found in the clubhouse. They can set the rules – only a handful of members and they owned the land. As times went by, the once very exclusive club faced a problem, the founders had, one by one, “gone to sell salted duck eggs” (Teochew phrase for “passed away”). So the remaining founding members and some who inherited the membership from the fathers decided that they need to open up the club for it to sustain financially and leaves its mark for posterity. 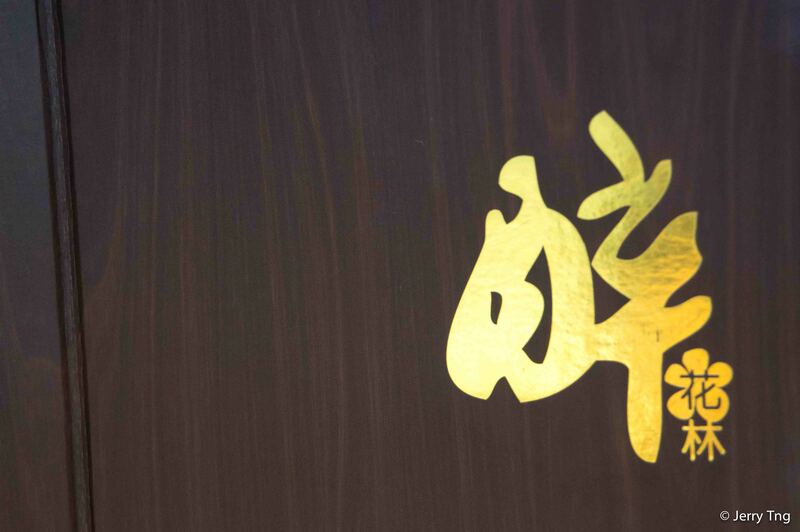 With one rule remaining – you need to be Teochew to join the club. 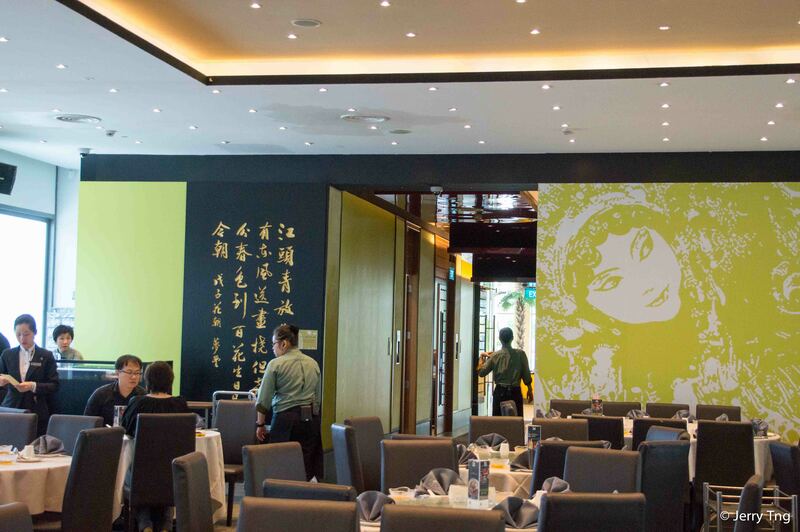 The original restaurant has since been managed by Jumbo Group (whose founders are Teochew as well). As part of the takeover exercise, they employed a Chef from the motherland – a Teochew chef de cuisine who has honed his skills in Hong Kong. Hence the very strong influence of Cantonese techniques in his creations. 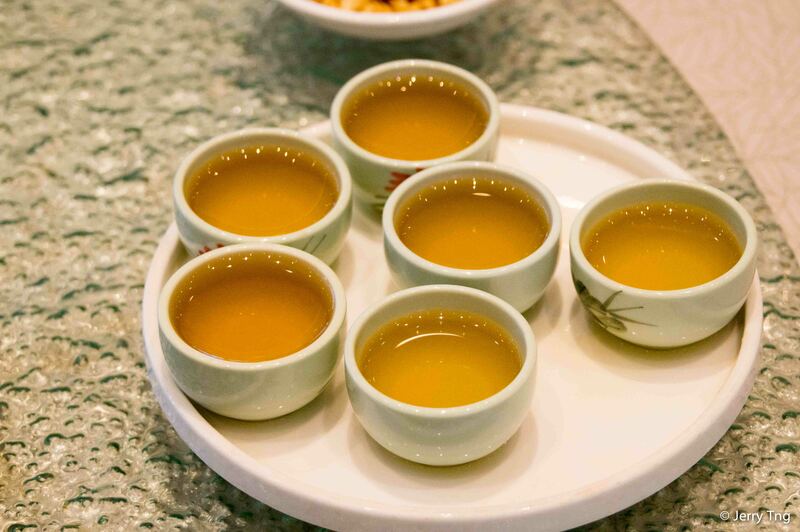 First, you start with a cup of strong TieGuanYin 鐵觀音 – this tradition in Teochew cuisine is actually more Hong Kong than Singapore, though Teochews around the world pride ourselves in enjoying this “expresso” of the tea world. 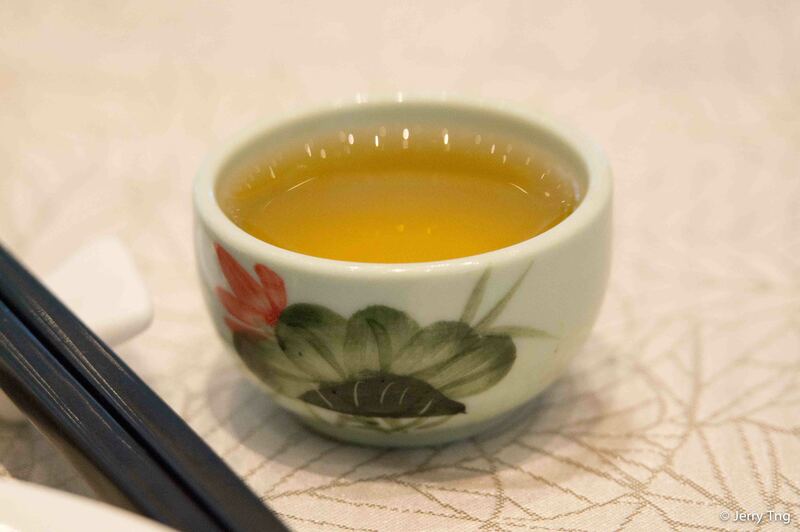 The tea was of a fermented variety and produced a dark, complex taste from the original Oolong. And we brewed it for a longer period to release all the tannins that produced the bitter (in a good way) “siap-siap” taste. This tannin actually acts as a digestive and helps in our appetites. However this version was actually quite weak (maybe because we were the first table for lunch) though the tea leaves used were quite good. 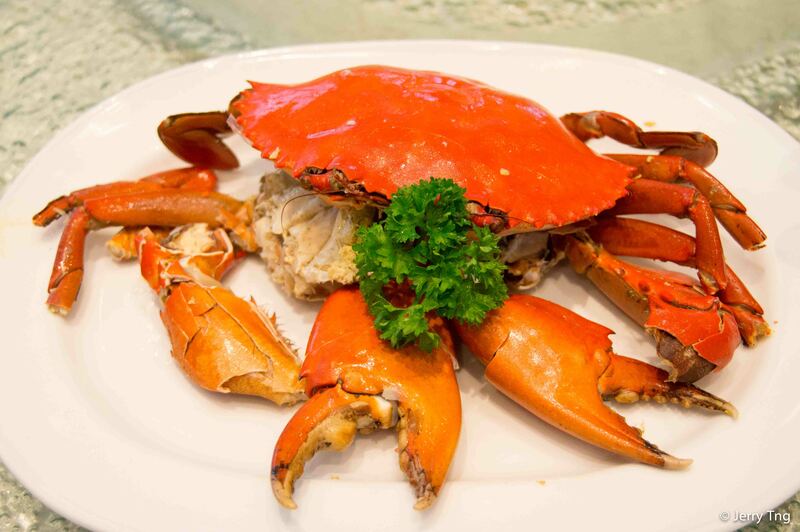 Teochew Cold Crab 潮州凍膏蟹 is a classic. You take a crab that’s full of roe and steamed it. Then it is quickly chilled to 4-5 deg to retain the freshness, but above freezing to prevent the texture being destroyed by frost. This is done in an exclusive fridge that is used for the crab, and not in the general fridge so that the taste is not altered but the other smell in the fridge. A lot of work which explained it’s usual high price. The crab used was a bit too small, but it still have the roe. 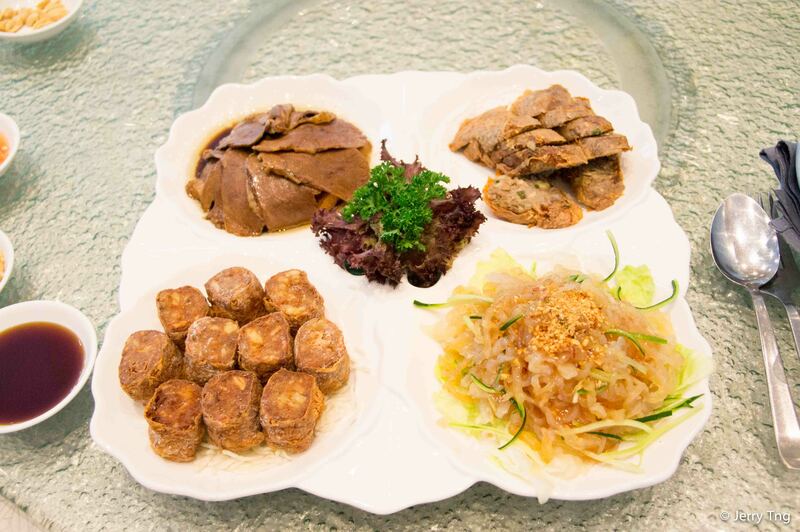 Four combination starters 四寶拼盤 consisted of 4 different starter/appetisers that are Teochew classics except for the Jellyfish. Goose disappeared from the dining tables in Singapore in the 90s when all poultry was processed offshore after outbreaks of Avian flu. So everyone improvised and used duck instead of goose to prepare this dish. My niece did not remember how goose tasted like. Mother was all nostalgic about this meat. Goose was reintroduced these couple of years with imports from Taiwan. So how did it fare at our table? Tasted like duck was the general comment. Mind you, you have to pay extra to change the duck to goose. 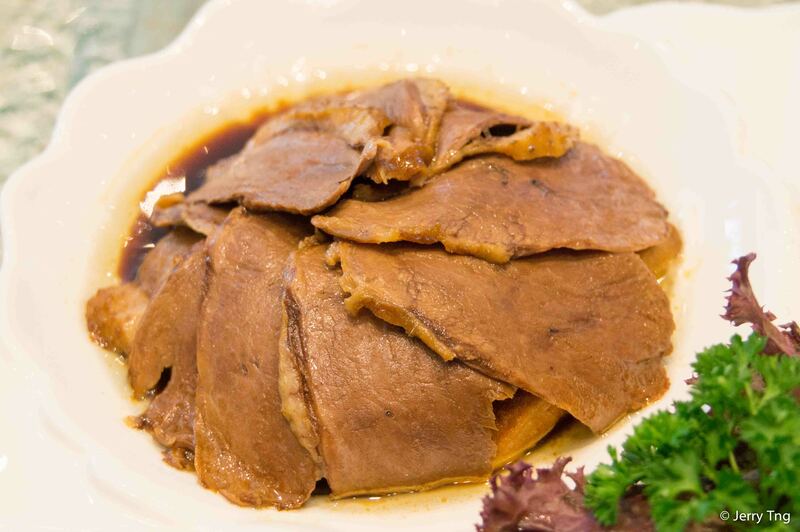 Goose is a staple on the Teochew dining table. Every part of the goose is not wasted. Goose livers (not the foie gras kind) are collected and either braised or made into a mash and filled into rolls and deep fried. Goose liver roll 鵝肝卷 was actually very good. They used bean curd skin instead of spring roll skin that gave it the extra crispiness. 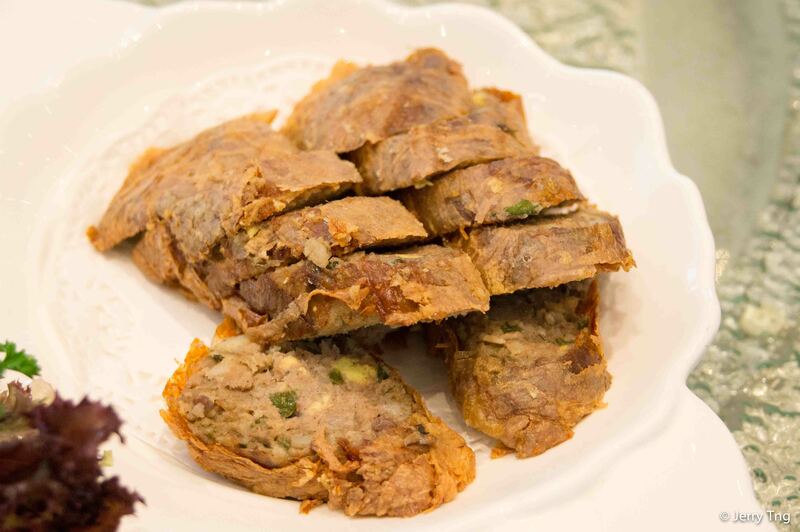 HarZou 蝦棗 (another classic) is made from combination of minced pork, minced shrimp, minced fish, water chestnut bits and other crunchy vegetables from the root family and rolled into bean curd skin, steamed to form the shape and then cut into small pieces and deep fried. Mom’s version is best. This was not bad. There was a good ratio of the ingredients, and not too much starch to hold them together. I tried to made this dish under Mom’s supervision, the most difficult part was the proportion of flour to be used to let everything stick together. To much flour it will taste like a very bad fritter. To little flour, the balls will disintegrate when fried. Sometime you need to know how the dish was made to appreciate the seemingly simple dish. 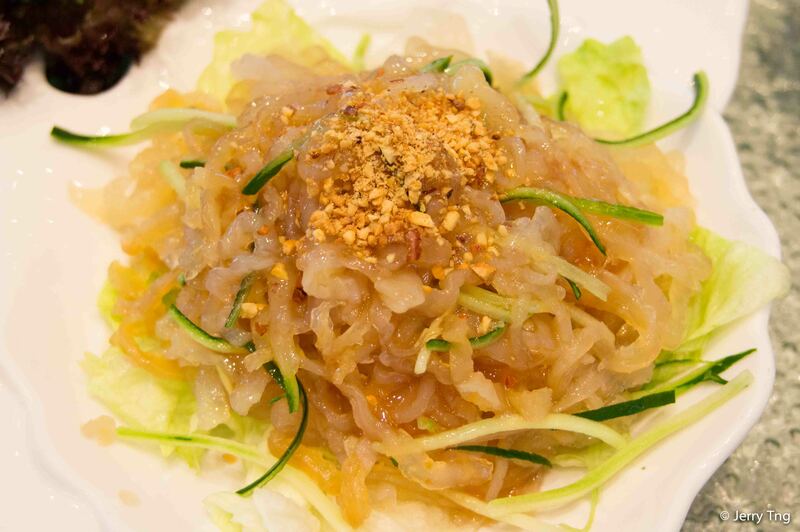 The Jellyfish is served in Teochew cuisine but usually flavoured using a simple vinegar and sesame sauce. 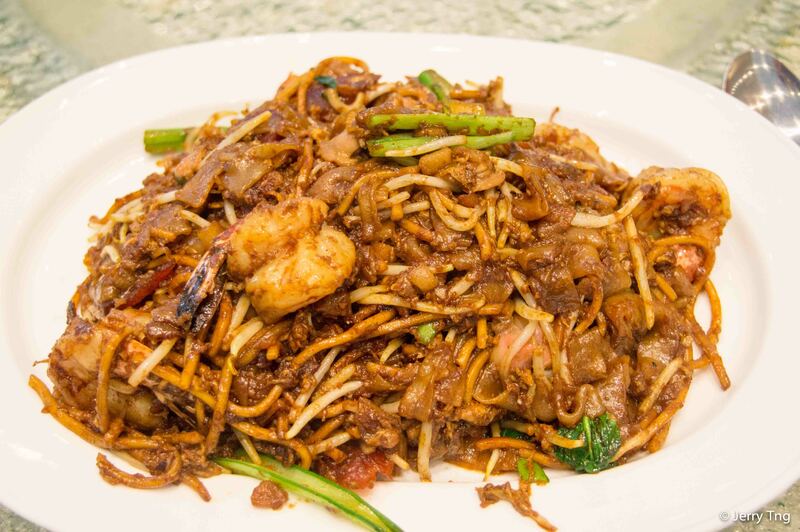 This version has been adopted for Singaporean tastebuds – which featured a Thai sweet chilli sauce. Tasty nevertheless, we have not had this served for a long time. I wondered when it started to be left out of the menu since it was considered a cheap ingredient. Jellyfish is not an endangered species. Serve this instead of shark fin’s please. 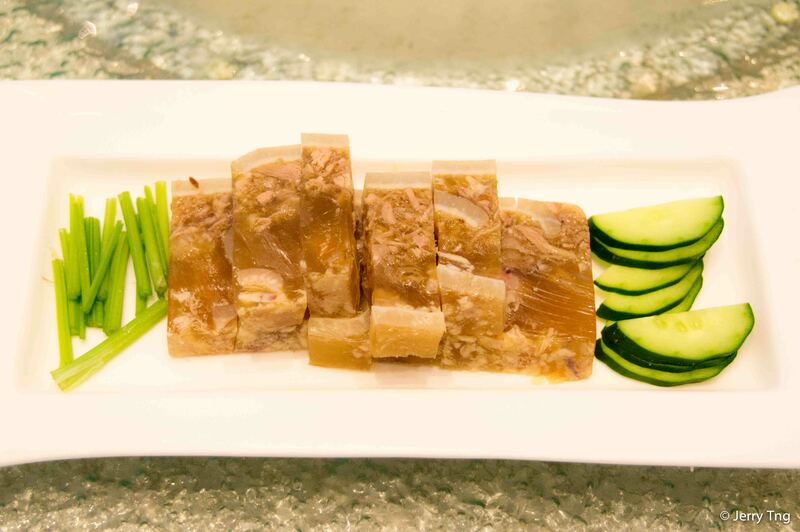 Jellied Pig Trotter 豬腳凍 is made traditionally by boiling large amount of pig skin, trotters and other parts with lots of collagen into a thick broth. The meat and skin are chopped and then reintroduced into the liquid. If there’s enough collagen, it will actually harden into a jello when put in the fridge. The cheat-version will put gelatine powder to harden the jelly and how do you tell which is which? Leave it at room temperature, and the jelly will start to melt. Their’s didn’t melt and I don’t blame them. You do not want to serve a soggy dish that disintegrate when you pick it up with chopstick. Steaming is a technique that is widely used in Chinese food, and especially Teochew. 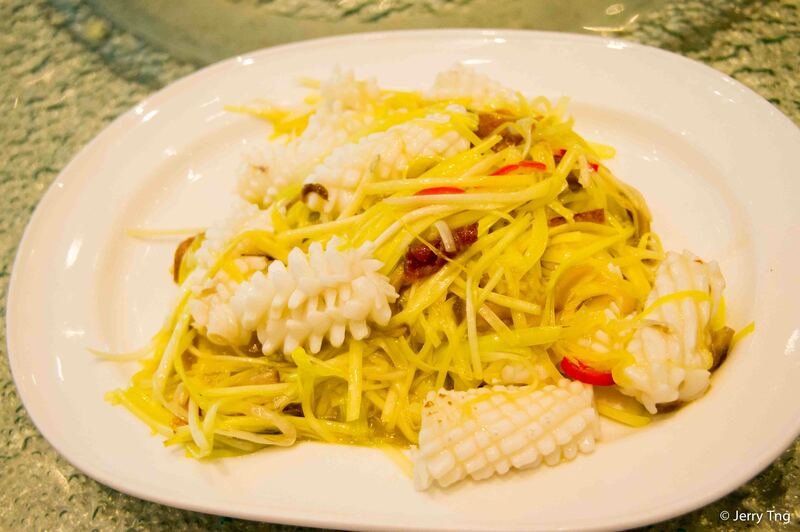 Teochew has been blessed with great seafood and river catch, and coupled with the thriftiness of the clan, Teochew is famous for another contribution to Chinese cuisine – preserved vegetables. Preserved olives, preserved Choysum roots, preserved plums, etc they formed the basis of the taste in steamed dishes to provide the tangy, savoury results from a very bland technique. 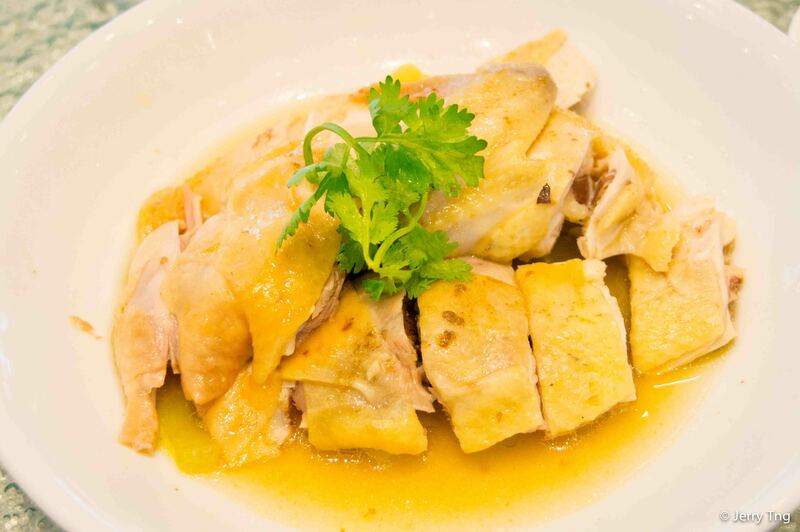 Puning-styled Steamed Chicken (普宁白切鸡) is variation of the Hainanese Chicken – the taste is enhanced using preserved vegetables used in the steaming process, and the stock that is drenched over the serving. I found this chicken a tad overcooked, making the flesh tough. It would be perfect if the chicken was poached in the stock when it was 70% cooked during the steaming process, thus sealing in the flavour and cooking it using the remaining temperature. 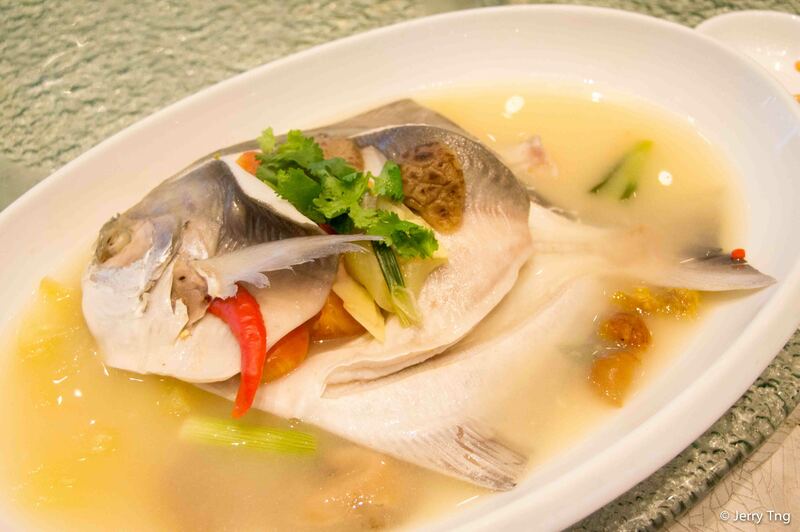 Steam pomfret 潮式蒸斗鲳 is the classic Teochew dish that you cannot usually find back in the hometown. Pomfret of this size was not common back there, so it would be substituted with our fish of a similar texture. 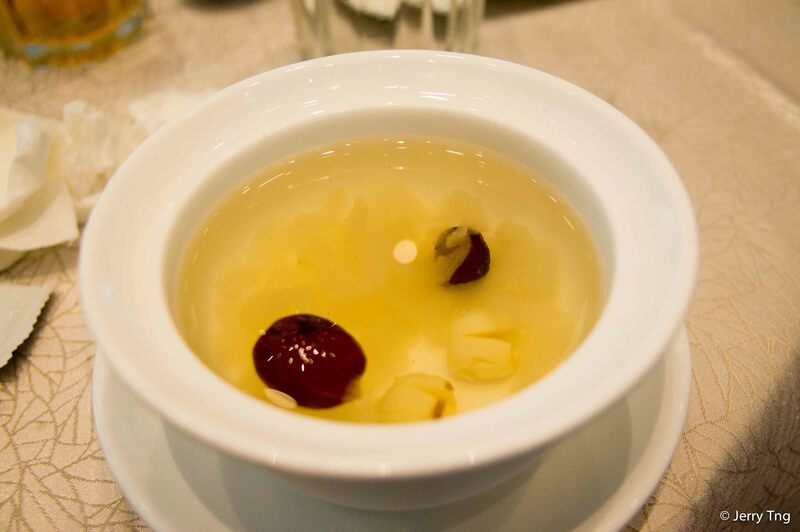 The flavour came from the sour plum, preserved caixin, lard (yes, lard is used to lower the cooking temperature thus helping the steam to cook the dish using a lesser time so that the flesh remain firm and just right) and lots of tomato, spring onions, dried mushroom, and ginger. The Chinese parsley was the finishing touch. The fish we got was about 800g (a bit small for 10 persons). The right size would be 1.2kg and anything larger will mean tough meat. Chives with squid 韭黄炒吊片 was my mom’s favourite Teochew dish. 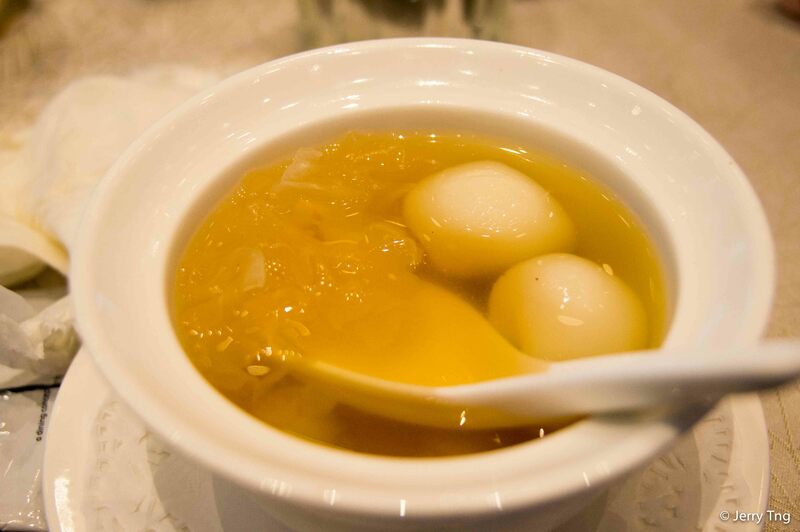 She fondly reminisced about the one time she had this dish in Hong Kong, and she could not forget how good it was. Just happened that this Chef was from Puning and was working in a HK Teochew restaurant before he came. So we would expect this dish to be close to what mom had years ago. Either her memories have failed her, or her tastebuds were numb, she insisted that this was not it. My only complaint about this dish was the lack of dried bonito fish 铁薄, or the sound alike, I only know the Teochew name for this dried bonito. 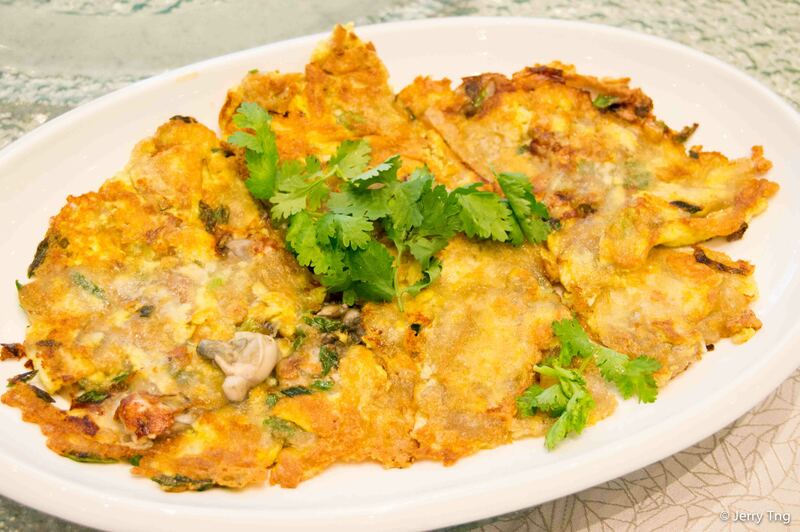 The oyster omelette 蚝烙 was the original version with less eggs and more tapioca starch. Crispy, wok-hei yet slightly cooked oysters were the main characteristics we were looking for. And of course, less oily then what mom used to make 🙂 They fared quite well, except there were not too many oysters. Olive fried rice 橄榄菜炒饭 was not the Mediterranean version of risotto with olives, but a preserved olive leaves and chopped olives fried into the rice. Nothing to shout about. 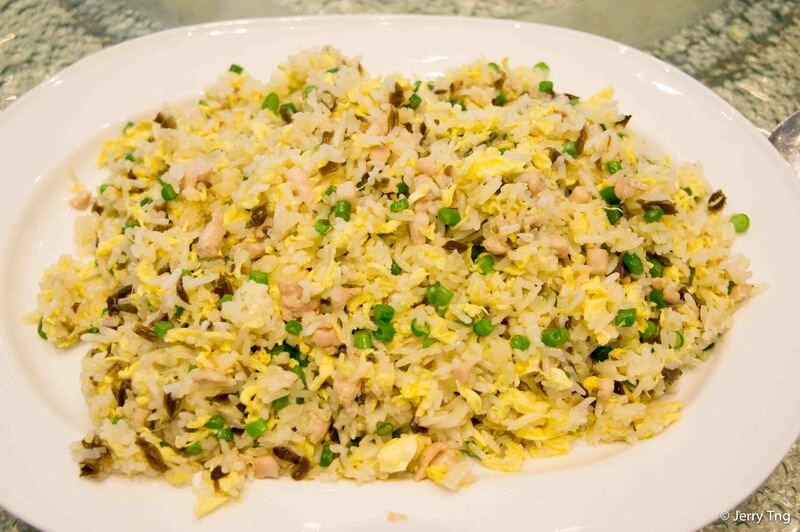 Chaekwaytiao 炒粿条 was not exactly a Teochew dish, but it was the first time I saw it in a restaurant, so we tried it anyway. The hawkers do it better. 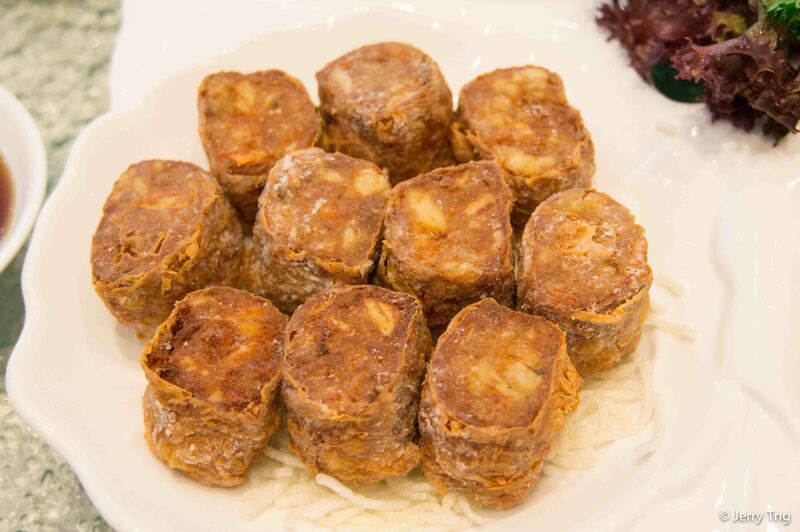 This was another dish that mom complained that no one does it better than the ones she tried in HK (was it the same restaurant, she could not remember). Mom’s version was better, and they broke the rules – it was supposed to be vegetarian, but this one had dried scallops all over. Three desserts were tried. 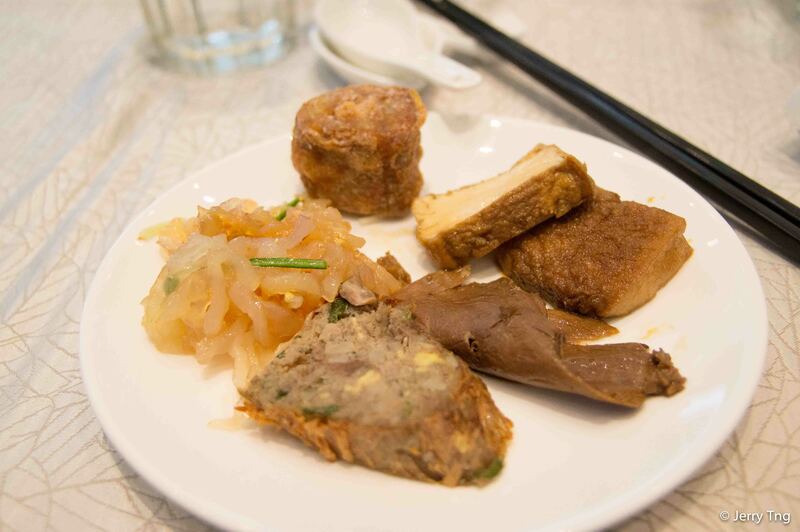 The best was the Teochew yam paste – this was one of the best, if not the best, we have tried in Singapore in many years. 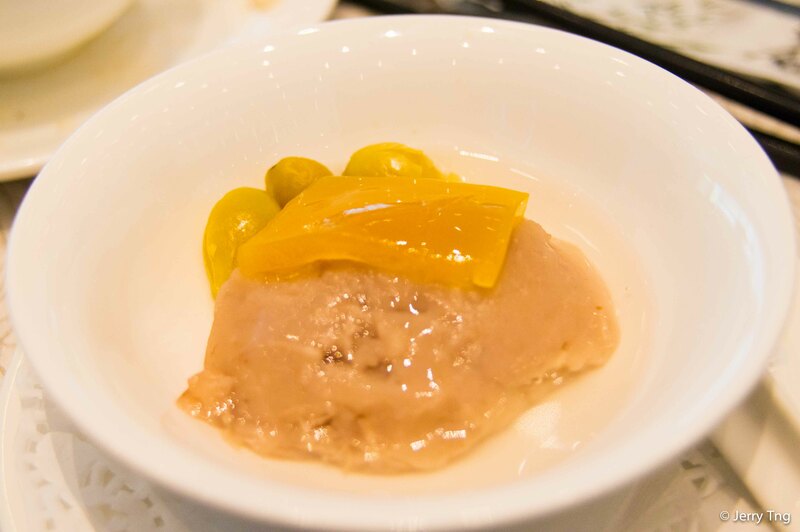 A neatly steamed piece of pumpkin on a smooth yam paste with a slightly sweet glaze with gingko nuts on the side. Not only the presentation was good, the dessert was not too sweet and everyone loved it. The rest were quite normal. Services was good. Price was reasonable. Food was average to above average. Set menus were quite pricey because they featured roast suckling pigs and shark’s fins, so I recommend a la carte. The location was an issue, because you cannot get any public transport to get there.